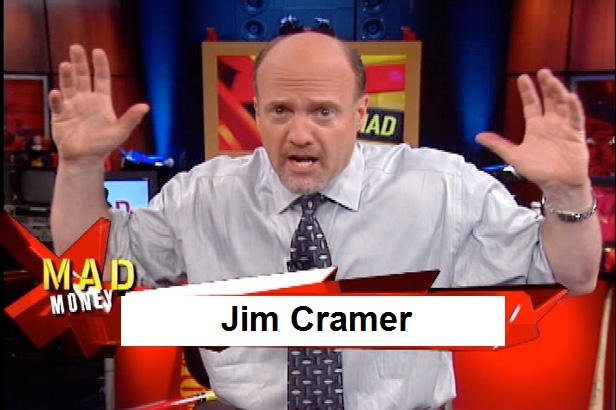 …nor does it stop Cramer from bloviating with confidence. Has anyone noticed that Jim Cramer bears a striking resemblance to the bald, gap-toothed, grinning Mickey Dugan of Hogan’s Alley comic strip fame? Okay, I’m not expecting anyone to jump out of his or her seat in a squeal of self-satisfied exuberance at noticing the similarities between Jim Cramer and a comic strip character that achieved fame slightly before the dawn of the twentieth century. But Mickey D. (better known as “The Yellow Kid of yellow journalism”) and Jim C. do have a bit of the same swagger in their approach to the issues of the day. Originally appearing in Joseph Pulitzer’s New York World and subsequently William Randolph Hearst’s New York Journal shortly before 1900, Mickey Dugan was normally festooned in an ill-fitting yellow nightshirt; it was essentially a hand-me-down that bore witness to the urban squalor from which he derived. The alley which he stalked was replete with oddball characters (Squawk On the Street anyone? ), all of whom contributed to airing the soiled laundry of the day. 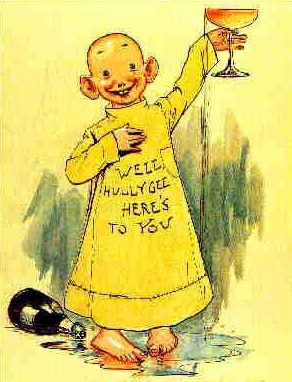 Over time, The Yellow Kid earned a reputation for speaking in a serrated streetwise slang which the artist scrawled on the front of his nightshirt. Whether accurate or not, the comic strip was a political touchstone and a hallmark of the turf wars between newspaper titans William Randolph Hearst and Joseph Pulitzer. It’s more than fair to say that this dueling duo foisted an agenda or two upon an unsuspecting public through the eyes of our young slum dweller. But let’s get back to our modern day incarnation. If you can’t seem to draw any parallels between Mickey Dugan’s look, demeanor, and actions and any episode of Mad Money, then I can’t help you. But look closely and soak it in. They’re both short, bald, and like to hold forth on topics about which they often know very little. So now you be the judge. This entry was posted in Business & Finance and tagged Jim Cramer, Mickey D., Mickey Dugan. Bookmark the permalink.